The Spartanics SR350 is a base model semi-rotary converting solution for entry level label converters. This user friendly, compact machine was designed for the label converter that demands quick job changeovers and quality results, but seeks simplicity. Capable of running at speeds of 80 meters per minute, the Spartanics SR350 provides quality cuts while meeting the industry’s growing demand of faster cutting speeds. 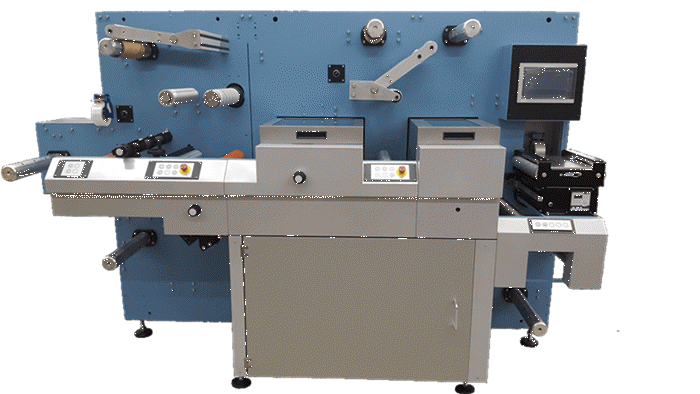 In addition to the quality semi-rotary die cutting, label converters are able to further enhance their label and packaging products through the utilization of several converting options, including corona treatment, varnish, lamination, auto back scoring and more. Interested in incorporating laser into your production? Check out the laser model, SRL350 Semi-Rotary Converting Solution. The SR350 Semi Rotary Converting System is able to be integrated with the most popular converting options available in today’s industry. For more information on how Spartanics can provide a solution for your specific needs, please contact us by filling out our ‘Contact Form’ or call us today at +1 (847) 394-5700.